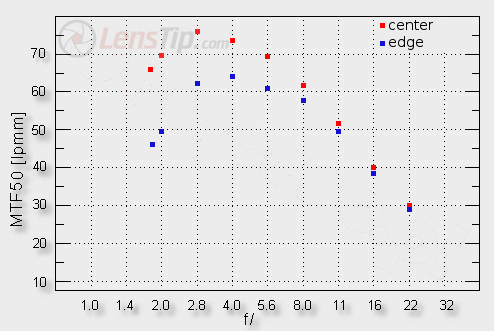 Most of the Micro 4/3 optics’ tests were based on RAW files from the Olympus E-PL1. We chose that body due to the lack of differences between vertical and horizontal MTF50 values and no interference into RAW files. In order to be consistent, we decided to use the E-PL1 as well in this test. It’s worth reminding here that the decency level is placed around 42-45 lpmm. So far the highest result among all brand name optical devices on this sensor was scored by the Leica DG MACRO-ELMARIT 45 mm f/2.8 ASPH. MEGA O.I.S. which, by f/4.0 reached as high as 80 lpmm. The results of Panasonic “pancakes” were a bit worse - the 1.7/20 model brushed against 75 lpmm and the wide angle LUMIX G 14 mm f/2.5 ASPH exceeded slightly 70 lpmm. Now let’s see how the Olympus M.Zuiko Digital 45 mm f/1.8 compares here. Seeing such achievements you only want to clap and cheer. In the frame centre, already at the maximum relative aperture, the lens reaches an excellent result of 66 lpmm. On stopping down it has no problems with exceeding 75 lpmm. Really, you could hardly expect much more. 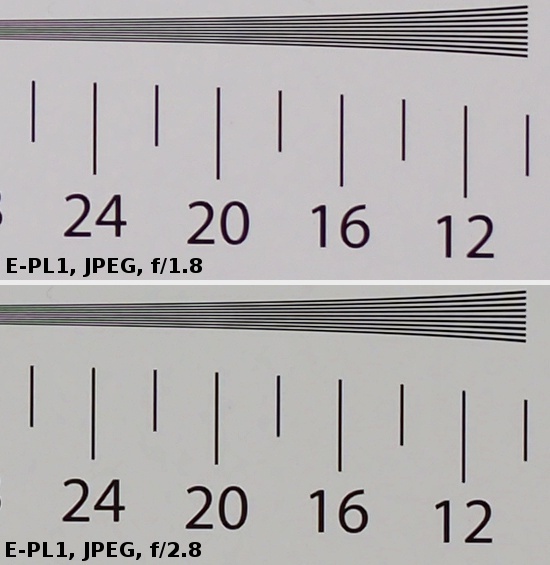 You can speculate why the lens doesn’t get to the level of 80 lpmm, like the Leica 2.8/45 did. There might be two reasons. First, slower macro lenses usually break resolution records and fast portrait “primes” – no. Secondly, the Leica 2.8/45 didn’t exactly shine on the very edge of the frame and the Olympus 1.8/45 performs there very well for a change - already at the maximum relative aperture the image is fully useful. It rarely happens in the case of telephoto lenses with such aperture fastness. To sum up we deal here with a splendid performance in the frame centre and equally brilliant results on the edge. There is really no sense in picking holes and wondering where those several lpmm, the tested lens’s result differs from the maximum Leica’s 2.8/45 Macro achievements, have gone. At the end we present the crops of our test charts, taken from JPEG files.